One of the things I love about taking photos is capturing something not many people get to see. The milky way shot I got last summer is one of my favourites of 2017. 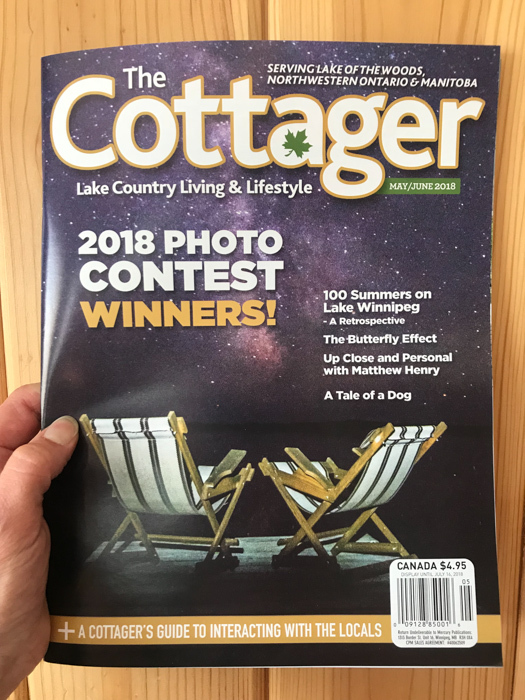 I submitted it to a few photo contests and was pleased to have it chosen ‘winner’ by The Cottager magazine. The magazine editor (and contest judge) writes. 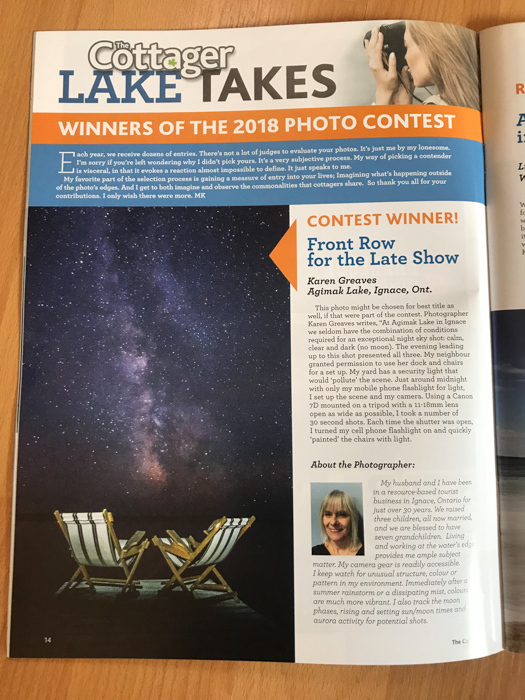 “This photo might be chosen for best title as well, if that were part of the contest” Glad he liked it. 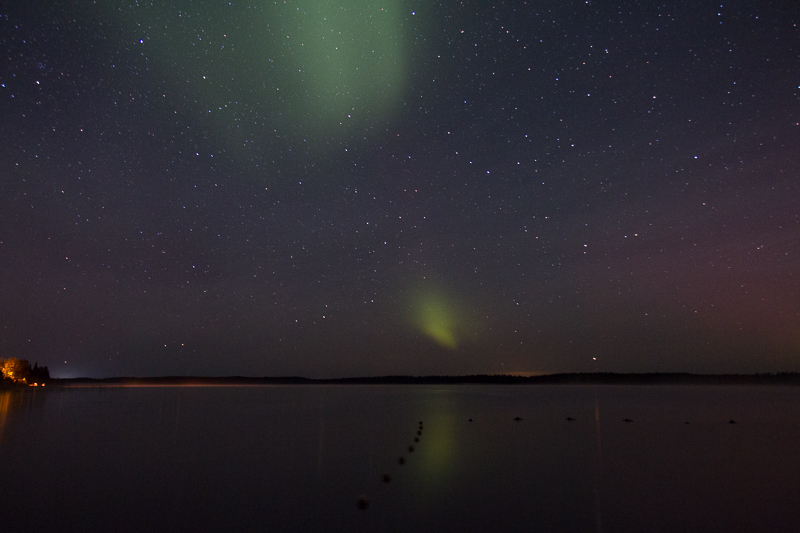 On Agimak Lake in Ignace we seldom have the combination of conditions required for an exceptional night sky shot: calm, clear and dark (no moon). The evening leading up to this shot presented all three. My neighbour granted permission to use her dock and chairs for a set up. My yard has a security light that would ‘pollute’ the scene. Just around midnight with only my mobile phone flashlight for light, I set up the scene and my camera. 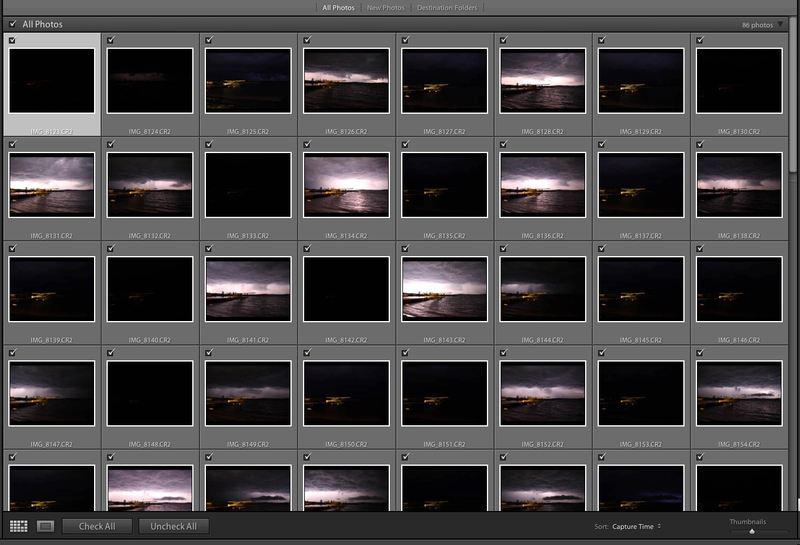 Using a Canon 7D mounted on a tripod with a 11-18mm lens open as wide as possible, I took a number of 30 second shots. Each time the shutter was open, I turned my cell phone flashlight on and quickly ‘painted’ the chairs with light. This one was my favourite. This image is available for purchase on canvas or fine art paper for framing. I’d be happy to discuss options with anyone interested. Check out the Prints page for pricing and other images available. 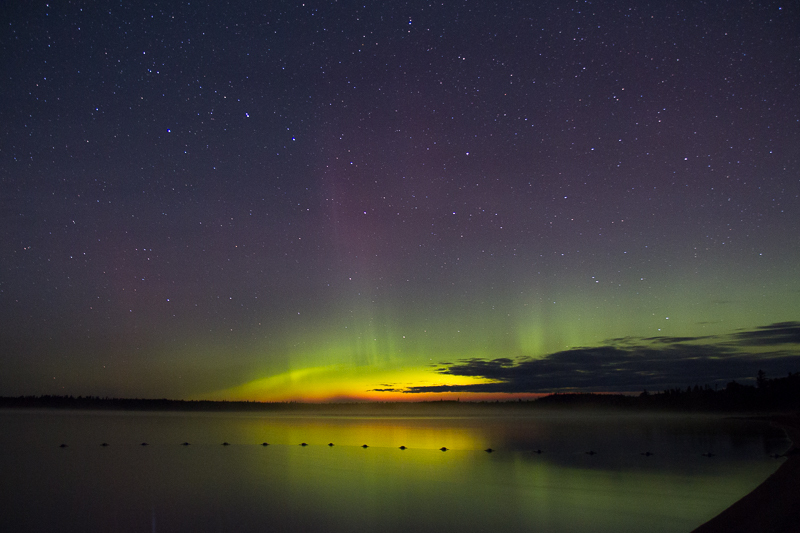 All my aurora apps were buzzing with notifications of potential aurora activity and the weather apps predicted clear skies, so I convinced my photo buddy, Mel, to join me for a late night stop at Sandbar Provincial Park. 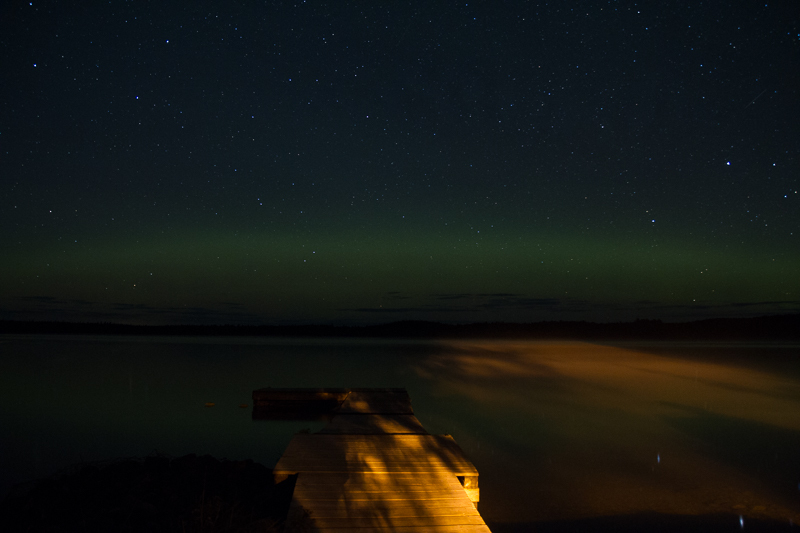 When we arrived an the landing, which conveniently extends directly north from the shore of Sandbar Lake, there was a hint of an arch of green glow on the distant horizon. Eventually, some activity occurred along with additional colour. 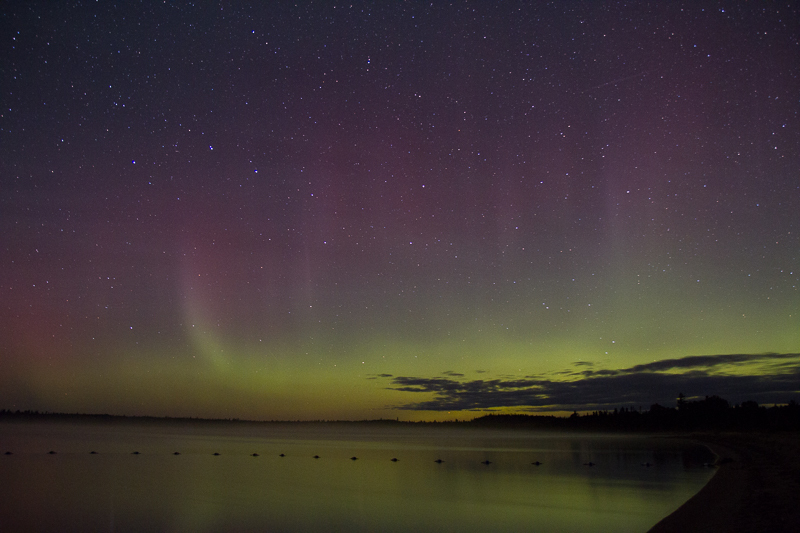 The purples aren’t visible to the naked eye; prolonged exposure seems to bring that out. While we waited for something spectacular to happen, we tried our hand with some Milky Way shots form the skies behind us. Note: always take a look behind you every now and then while out on a shoot! I’ll share more about the Milky Way in a later post. 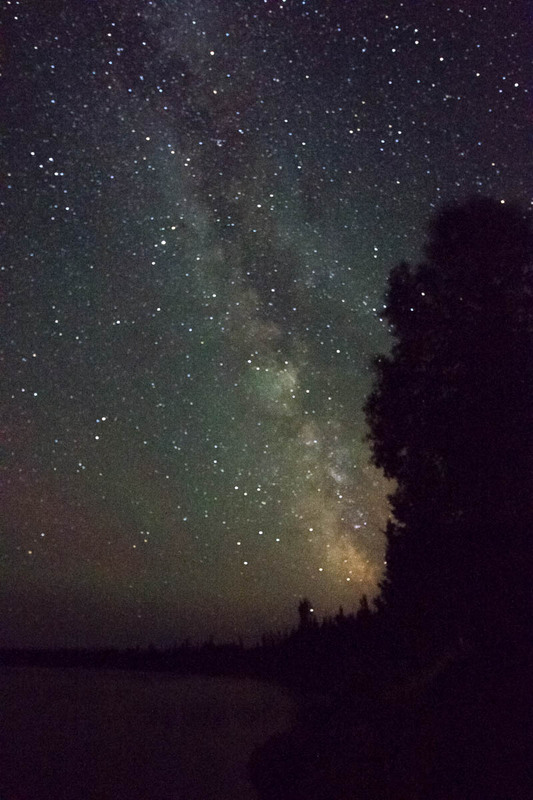 Since not much was changing in the northern skies and the band of Milky Way stars gradually moved behind the tree line, we decided to relocate for a better view of the southern sky. While doing that the sky behind us brightened significantly (remember to always check behind you!) so we headed back to the landing. The activity extended from the horizon to directly above our heads. It was difficult to know where to look or point the camera! 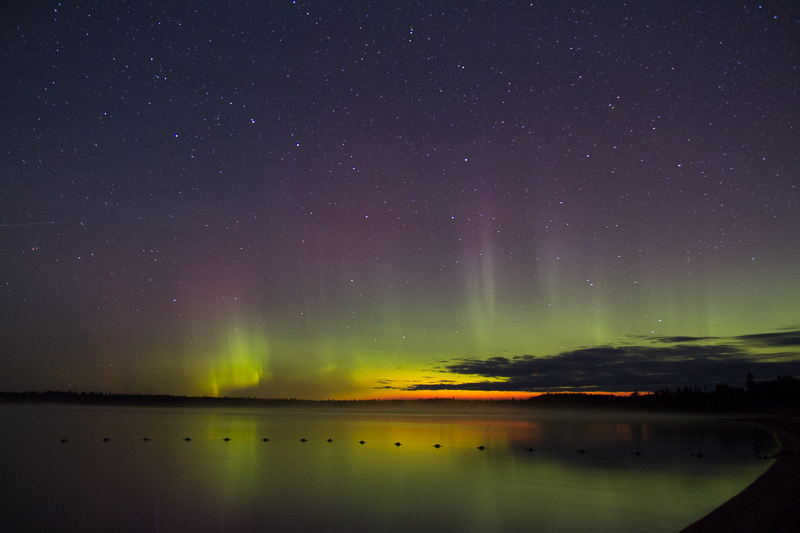 This image is a panorama I was able to have Photoshop construct with about a dozen portrait shots of the north sky. Can you pick out the Big Dipper? 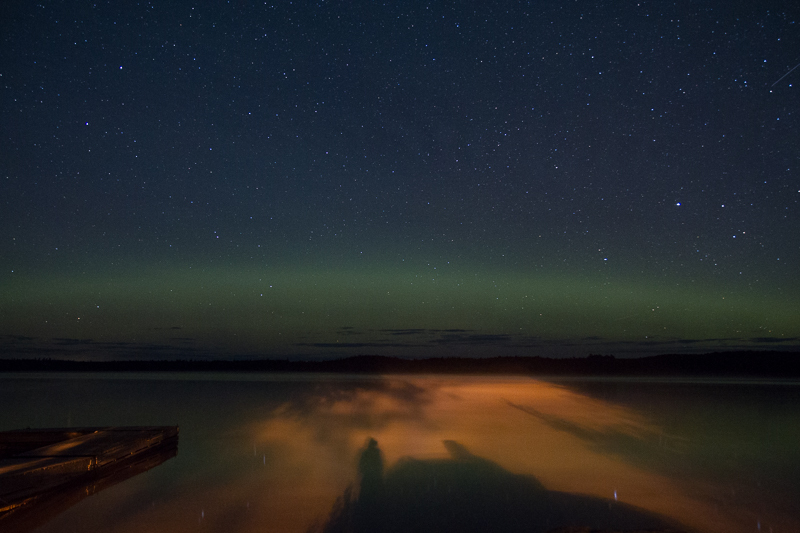 Was fortunate to enjoy a clear night out at The Cabin. There were some serious challenges with my gear (actually the operator) and I wasn’t able to get the focus set properly; so much yet to learn. But the lights of the Milky Way shone bright. Can’t help myself! 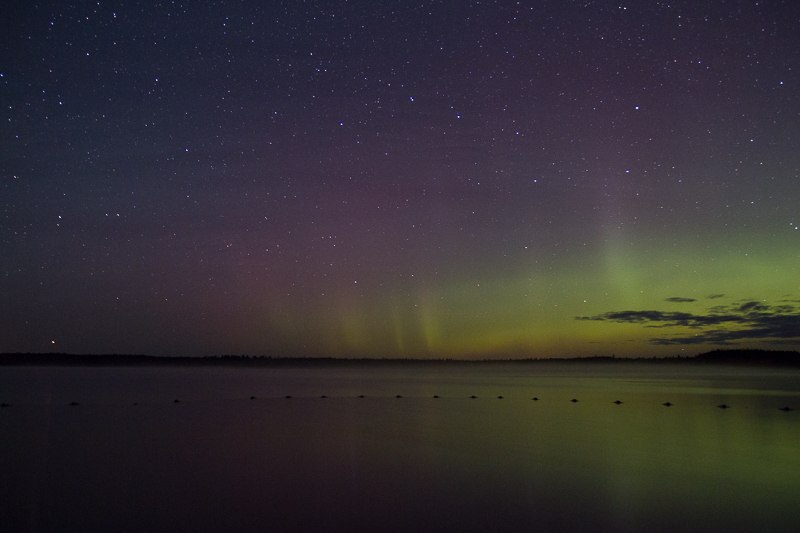 Just have to share some more aurora shots. The day after the previous shoot, I set about, in daylight, to find a better location; somewhere with a good line of sight, lots of northern horizon and preferably a lake in the foreground. 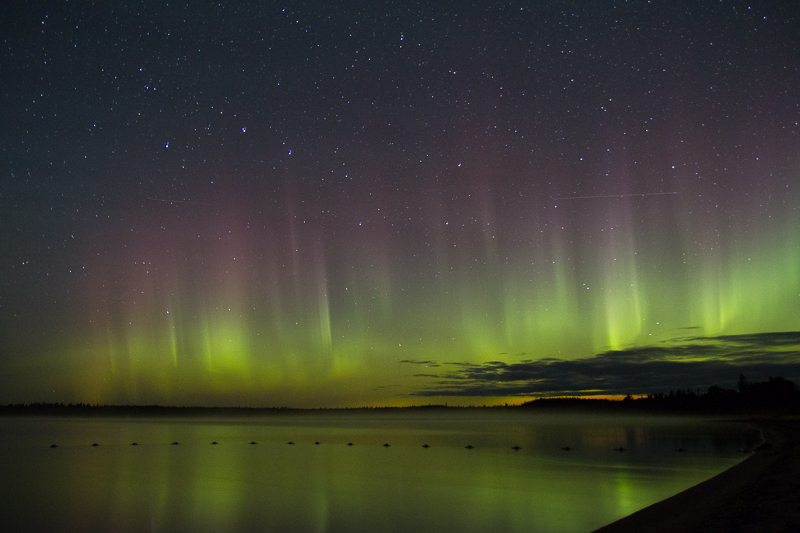 I found the perfect spot at the boat launch at Sandbar Lake Provincial Park. 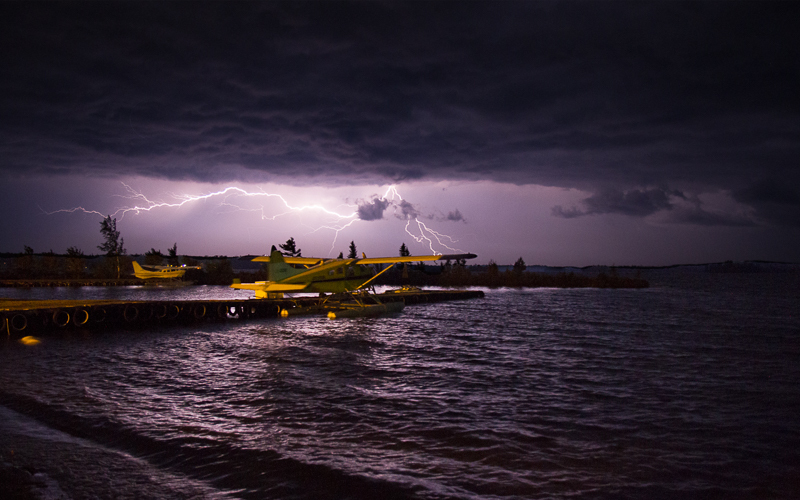 Just 15 minutes north of home up Highway 599, it had the perfect exposure and even a dock extending straight north into the lake!! Turned out I wasn’t the only one who thought this might be a great spot. It was just a few days later that I got a text from my photo buddy, Mel, that she was at the park, in the dark, alone. I rushed to meet her there, as a true friend should. There hadn’t been much to see and even when we got out of our vehicles in the safety of each other’s company, the sky was full of stars winking as if they shared a secret. We relocated to the boat launch I had picked out previously and found to our horror that there was a huge yard light extravagantly painting everything an evil shade of yellow and creating bizarrely distorted shadows. Here we sit pondering the situation. There was a little bit of mist rising on the water as odd globs of green appeared and vanished on the horizon and above us adding to the chill on our bodies and in our imagination. We moved again to a darker and thankfully less creepy part of the shoreline, the public beach. Note the floats marking the safe swimming area (below). The orangey-yellow shoreline at the very left of the shot is the despicable boat launch yard light and the extent of it’s effect out on the water. To the very right, a red-purple begins to appear and we turned our lenses northward again from this new vantage point. And then it kinda fizzled out which was okay with us at that point. The temperatures had dropped to 4C and we had not anticipated how cold that can feel after unseasonably warm September days! It was a fabulous show and truly did not look in really life like the camera captured! The naked eye could only pick up the some of the shades of yellowy green. It wasn’t until each long (20-30 second) exposure popped happily up on our preview screens that we were aware of any of the other colouring or most of the light! 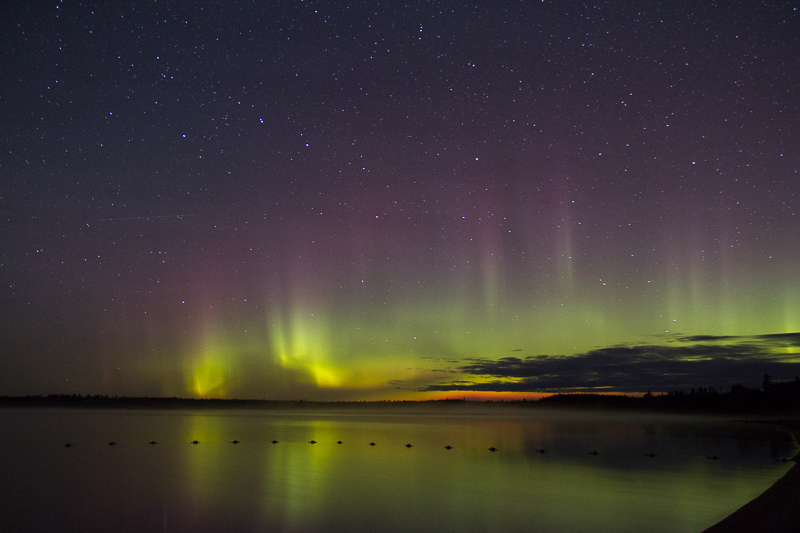 I’m certain the show continued without us as my Aurora Forecast app notification kindly announced once I was toasty warm under my covers, that the activity was ramping up! Next time. 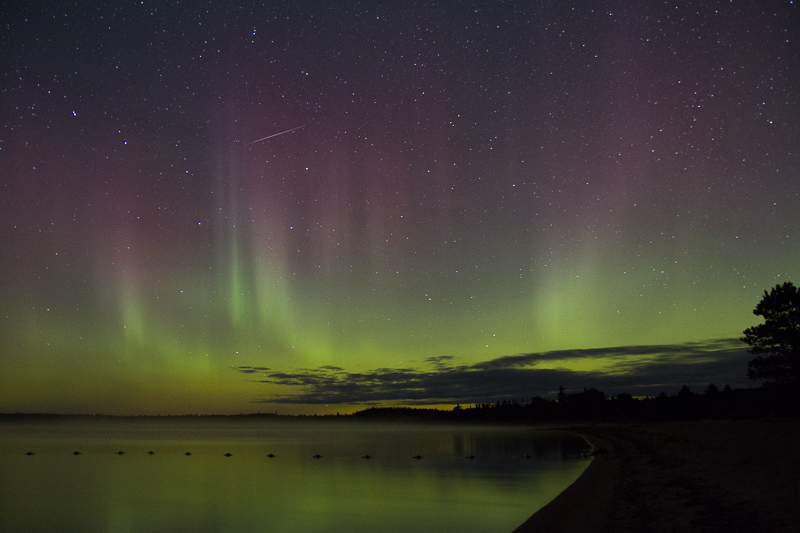 During the past few weeks the night skies have been alive with activity. 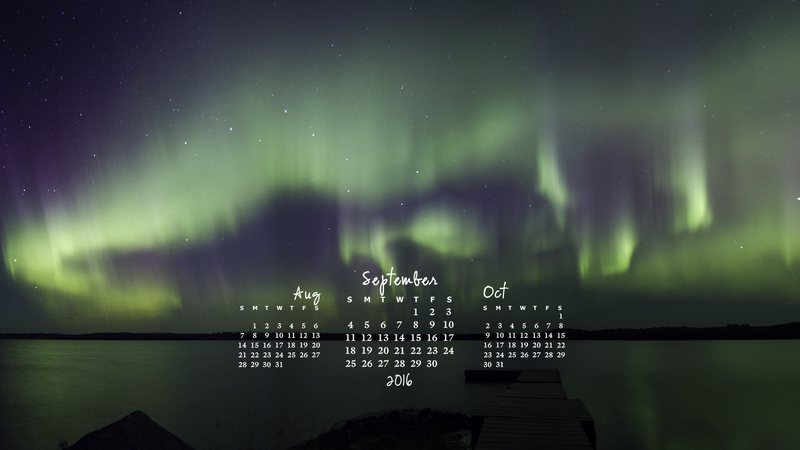 September 8th looked promising enough from the back of my house to tempt me out with my camera to a dark, isolated place to see what I might capture. At the base of a tower on Tower Hill, I popped up through the open roof window in my Rav4, propped my camera and tripod up on the roof and pointed it north. 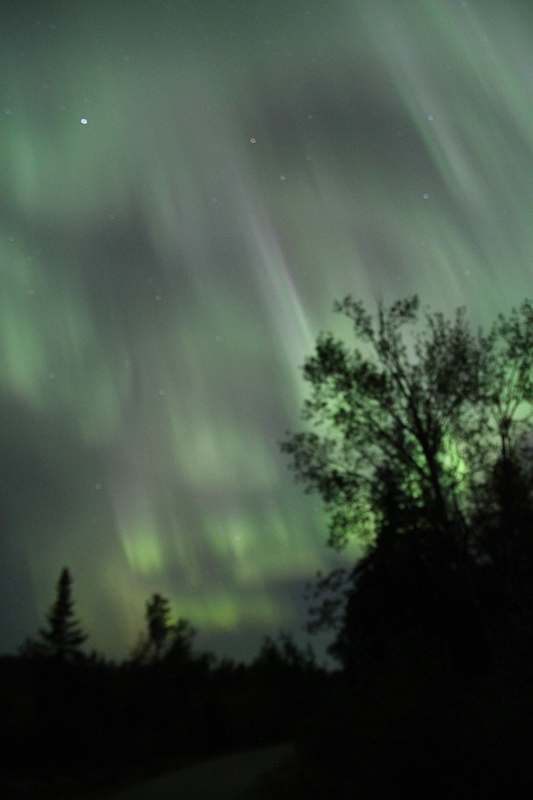 There was a steady stream of gentle green haze twisting and reforming just at the horizon. With a remoter shutter, I snapped several hundred (somewhat dark) images in hopes of being able to create a time lapse video of the movement since none of the individual shots appeared interesting on their own. Here’s what I posted to FaceBook. Not a real fair representation of what I saw but I’m learning. And then what I saw, took my breath away! The long lines shooting up from what was in my viewfinder extended directly overhead and almost to the opposite horizon; narrow ribbons undulated like parallel ripples in a narrow stream. The expanse of the lines of light was astounding. I relocated down the hillside, parked again and popped back out through the roof for a new perspective on the increasingly active sky. I truly didn’t know where to look. 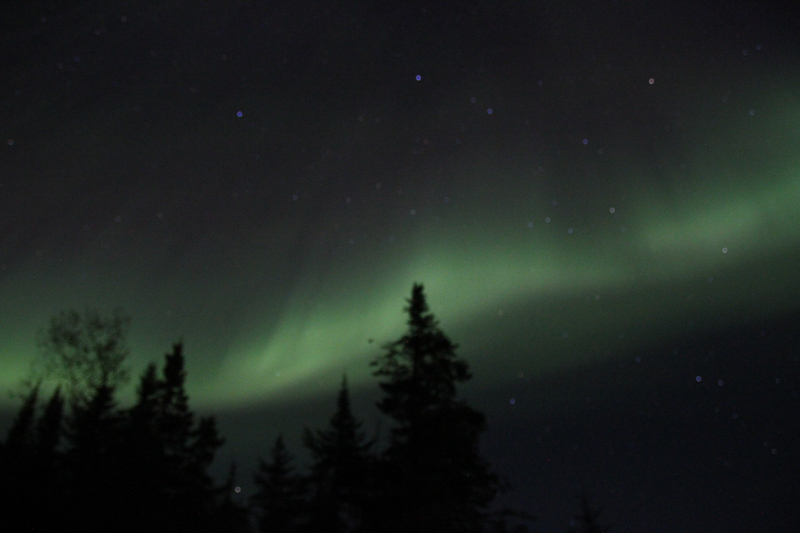 To the south, I could see a dancing of line of light mimicking the tree line. Directly above it began to look like a flower opening. 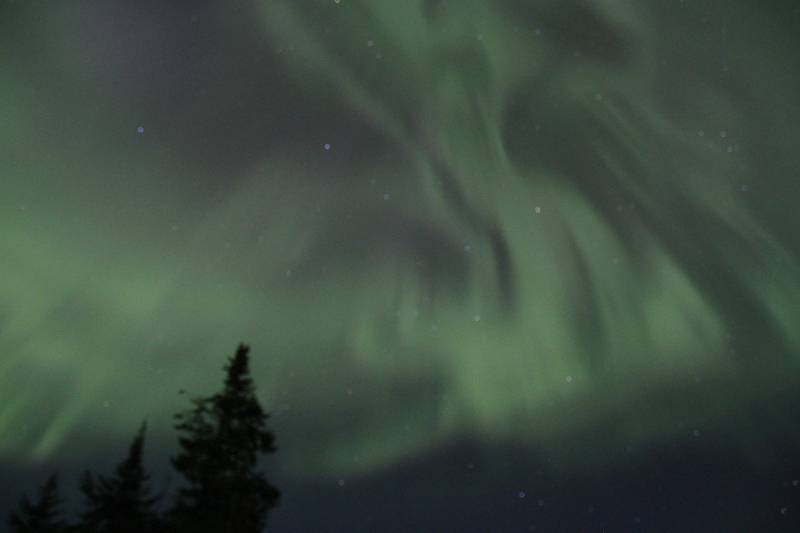 Then to the west over Ignace, it shredded itself into brilliant streaks. I decided to snap photos until my camera battery died or the card was full; which ever came first. I filled the card and headed home. It was hardly possible to sleep from the intense adrenaline rush of the experience.